Paul Corman-Roberts, poet/pundit/pulpist, knows how to get down. 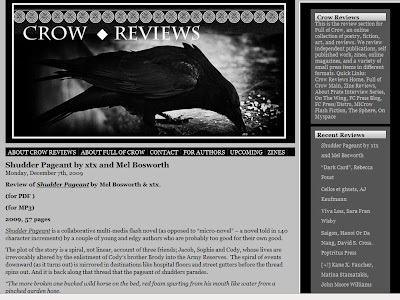 Check out his recent review of Shudder Pageant, the collaborative monster-piece by myself and xTx (click on image to enter Crow Reviews). PCR is, among other things, the poetry editor for the long running e-zine Cherry Bleeds, and a regular contributor to Full of Crow. thanks, eric. and i'm happy you like the new look. you get the assist, for sure.